The front cover of Labels & Labeling magazine, Issue 3, includes a peel and reveal label printed on a Graphium hybrid digital inkjet label press. 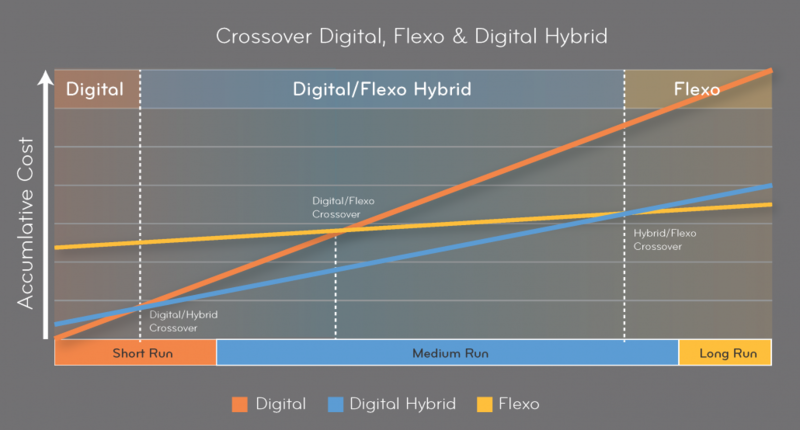 The way this hybrid digital label is constructed is a true example of what is possible with a digital hybrid production system. We purposely made it a challenging brief – a hybrid digital label that incorporates a number of processes to create an eye popping statement for the Labels & Labeling front cover, which stretches the perception of what is deemed viable for digital printing. We chose Health & Beauty as a target market. Mostly because it demands such high quality, and often includes processes and embellishments that are simply too challenging for a stand-alone digital press. 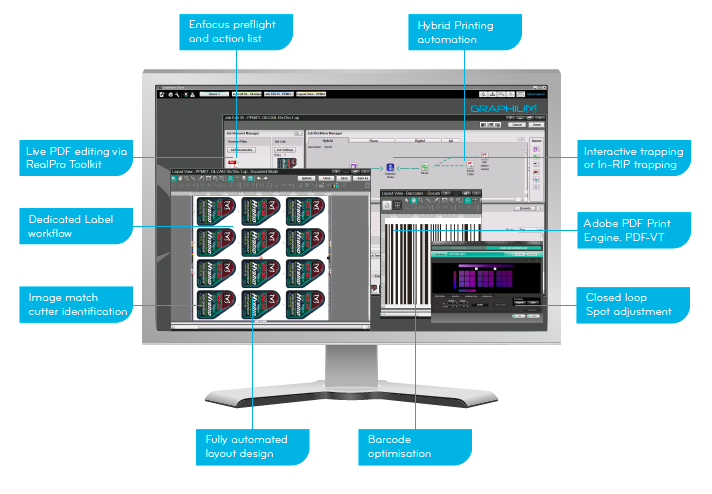 The tip-on hybrid digital label demonstrates Graphium’s capability to produce peel & reveal labels, utilising metallic spot ink, under and over white, fine text, delam/relam and varnish. As discussed in a previous blog post, Health & Beauty is one of the most demanding label market sectors. Effectively you are selling a liquid or powder, in a procured container, into a highly competitive market that is driven by fashion and image. Shelf appeal is one of the predominant aspects of the purchase decision for many products. In addition many product brands in the Health & Beauty segment consist of a range of products. This can necessitate different labels, in different languages and versions within one brand. Boutique brands from independent salons, small scale producers and private label combined with an ever evolving range of products and product variants drives a demanding set of requirements in a crowded sector. A balance must be struck between producing labels with high quality print and value adding embellishments efficiently and cost effectively. The broadest range of applications, requiring a mix of effects and embellishments can be produced cost effectively on a hybrid digital inkjet press – short, medium and long run. The proliferation of products and product categories is making it all the more challenging for brands to ensure that their products ‘catch the eye’ of the consumer. It’s absolutely critical for products to make a strong first impression. Health & Beauty labels must help their product stand out on the shelf – a hybrid digital label can do this. Metal and metal effects for primary packaging give the perception of a high value and luxury product. There has been a very strong move to metal components for treatment, colour, and fragrance packaging projects. Metallisation techniques are often chosen to give a skin care bottle, jar or cap a more prestigious look. 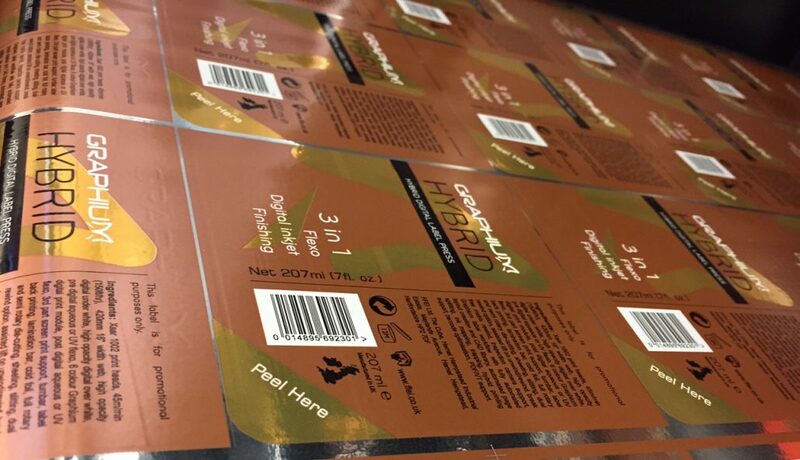 Labels and cartons are getting the ‘shine’ treatment as well, with the use of metallic foils, metallic pigments and metallic substrates. Texture is often used in conjunction with metal. Over use of high gloss metallic can actually have a negative effect on perceived value. A convertor needs to be able to control the look and feel. To do so they need to be able to create anything from smooth high gloss to a matt shimmer. Experimenting with combinations of techniques e.g. mat varnish over high gloss silver often creates the most innovative effects. The growth in peel & reveal labels has resulted from two main drivers. Labelling legislation is constantly changing. Countries are becoming more ethnically diverse driving more language variants on a single package. As a result, more and more information needs to be detailed on product packaging – yet brands want to maintain the product integrity, the elegant design concept that drives consumer purchase. This is a tricky balance to strike. In some cases it is impossible to include all the required information at a text size that consumers can effectively read. Secondly, peel & reveal labels open the door to more innovative ways to engage and interact with consumers. Digital and in particular variable data, is key in opening up these opportunities for multiple languages, cross product promotions and competitions. Variable data brings a new concept to labels. Traditionally this refers to black only numerical or bar code changes on each label. Now with full colour variable data we can look at changes in a totally different way. A good example is vouchers and competitions. A label could be peeled back to reveal a money off coupon. They could all be the same or a number of coupons with different values could be produced – in a single print run. The technical design of the label and how the different materials such as silver substrate, pantone metallic and process ink would interact with each other was achieved using Illustrator and RealVue 3D Packager. The ability to visualize your concept in 3D with all the metallic elements whilst you design, can take your vision of how concepts are put together to another level. Pantone metallic inks are not totally opaque and fairly matt. When printed over high gloss metallic PP they look more like metal yet reduce the reflective properties of the underlying PP creating a softer effect and more lifelike copper feel. In contrast Graphium UV inks adopt and blend with the underlying material allowing us to create a high gloss gold foil effect without the need of an extra plate. Black text and white areas are overprinted digitally. We have used both under white and over white to lift the impact of the Graphium logo. For the back label RealPro toolkit was used to auto create the white ink layer and apply a trap between digital and flexo parts. The layout was created automatically by sending the original 1up cutter design through Graphium Label workflow. The PDF design file was then exported to a drop folder. This allowed us to send the finished cutter design to the die-makers at the earliest possibility. The 1up graphic design was then submitted to Graphium Label Workflow and dynamically matched to the previously designed cutter. Matching through shape recognition rather than predefined queue or XML meta data eliminates the need for a drop folder for each layout or a MIS system capable of submitting layout instructions. Shape recognition has the unique advantage in that it can override PDF page boxes. When agencies design a label the page boxes will be setup for the brand not the convertor so page boxes are not reliable for precision artwork placement. The second advantage is if you have multipart labels the workflow will match items from an Illustrator art board or multipage PDF and split them into individual components. This enables them to flow any artwork directly to the correct positions on the design even if they are rotated.